Manners aren’t just for fancy restaurants. In a place full of hungry and hurried people, courtesy also goes a long way. According to someone who eats fast food daily (me! ), here are some things to keep in mind for the sake of the diners and employees. Do not approach the cash register or drive thru speaker before knowing what you will order. Also, as tempting as it can be, avoid browsing through ordering kiosks during peak times. Place your order promptly or let someone go before you if you are undecided. Ordering apps are perfect for those who take their time. 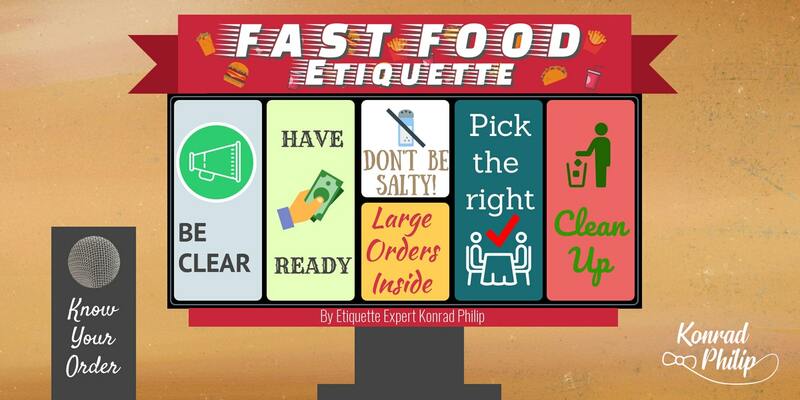 Distracted customers are among the worst pet peeves of fast food workers. Miscommunications happen when workers cannot hear your order clearly. Speak clearly and cut out background noise when in the car. Choose a seat appropriate for your group size. No matter how many burgers you have been eating, if you are on your own, you do not need a four-person booth! This is especially important in peak times. If it’s eaten on a tray, it’s for you to throw away. The manager at a fast food restaurant is likely helping with food preparation and pulling him or her aside to investigate no-pickles-gate will delay everyone’s order. Don’t mistake the employees for meat; they are not there to be grilled. Resolve issues respectfully with staff; they will escalate the issue when necessary. Fast food employees are not wait staff. On your way out the door, there are plenty of conveniently located garbage bins. Clear your table before leaving. Whether at drive thru or at the till, know how you are going to pay and have that method of payment, along with any coupons, in your hands. Be aware of parking spot limitations. If it is a curbside spot, do not park it in if you are going into a restaurant. That spot is reserved for people ordering curbside. Once you receive your order, drive away from the curbside spot. No need to be a schlub when getting your grub. Fine dining or drive thru, food just doesn’t taste right without good manners.